Internationally recognized technology research firm Harbor Research published a report analyzing the state of the current IoT platform landscape. The report highlights four important segments for platform performance: analytics, data management, device management, and data acquisition. The report concluded that niolabs delivers on all four segments and represents, "a forward-looking, emerging technology architecture that reduce the time and cost of providing complex, high-value applications." "A forward-looking, emerging technology architecture that reduce the time and cost of providing complex, high-value applications." 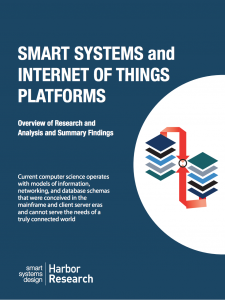 The report, titled SMART SYSTEMS and INTERNET OF THINGS PLATFORMS, reviewed and analyzed over 200 IoT and related data and analytics platforms. Of the 200+ platforms reviewed, niolabs was honored as a leader in the marketplace and given "true platform innovator" recognition in the report. Harbor Research is a strategy and technology research firm that works with leading technology innovators, product OEMs and service providers. We bring together a unique combination of domain knowledge, facilitation processes and an extended community of partners and expertise that enables our clients to discover, design and develop smart systems and services.